— Edward Abbey. "Desert Solitaire"
"Our Water" is an oil painting created in response to a proposed dam of the Gila River in New Mexico, the last continuous wild watershed in the United States. The Gila Wilderness is an invaluable cultural resource, and a wilderness sanctuary for many residents of New Mexico, both human and animal. The painting features a Coatimundi, and animal native to the area, and was painted on top of a Gila Wilderness Map used in a backpacking journey in 2015. The Tibetan Prayer flags, untethered and blowing in the wind, represent the ominous and foreboding feeling of a world made of concrete and steel. The Coatimundi, adorned with a halo containing a Mimbres pottery design, dances like Shiva, the Hindu deity, on one leg in the midst of change. The Gila Wilderness was designated the world's first wilderness area on June 3, 1924, Along with Aldo Leopold and Blue Range Wilderness, the 558,014 acres (225,820 ha) (872 sq. mi.) 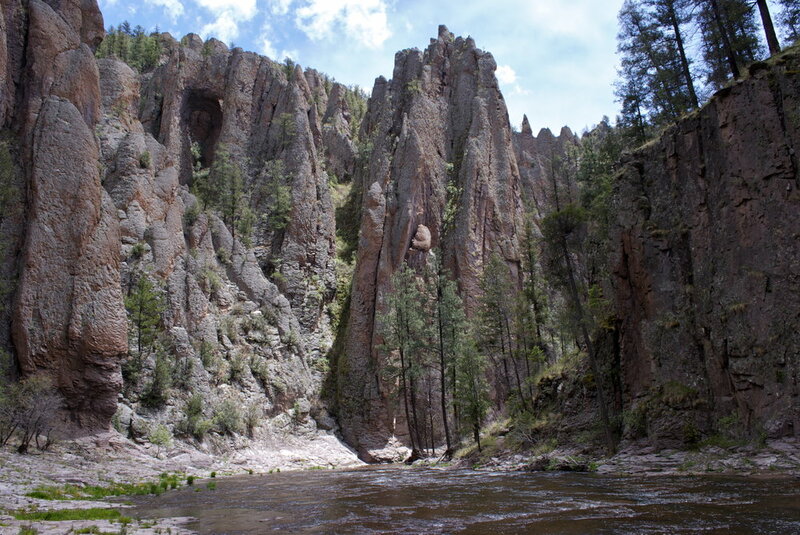 wilderness is part of New Mexico's Gila National Forest. - wiki intro. 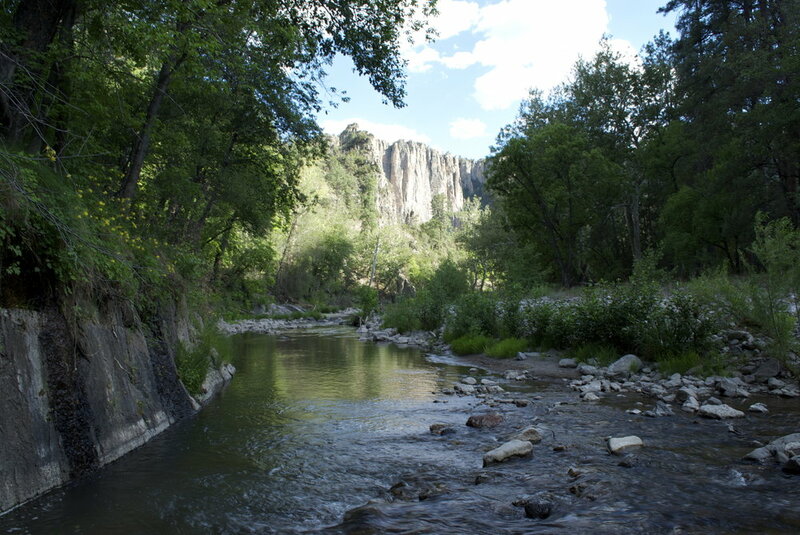 To me, the Gila is a sanctuary I have visited many times throughout my life. I have childhood memories of the Gila, fishing with my Dad and Brother on hot New Mexico days at Lake Roberts, and driving off road in the mountains without another human in sight for miles and miles and miles. As an adult, I have been on two long backpacking trips there over the past couple years. 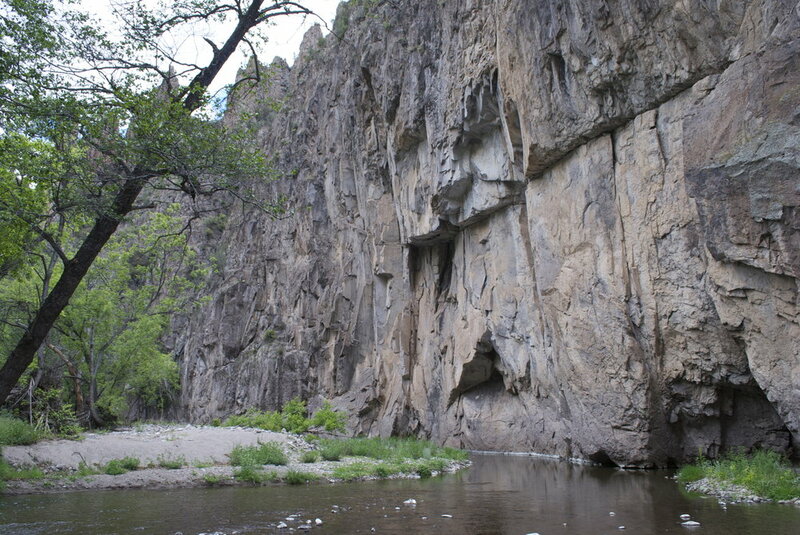 There are many reasons to visit the Gila. The place is spectacularly gorgeous and easily compares to the canyons of Utah, the meadows and cliffs of Yosemite, and the Rocky Mountain High in the late summer. However, the reason for my visit in April of 2015 was partly due to an urgency to see it in all its glory one last time before it was dammed up and damaged forever! The trip brought on feelings reminiscent of Edward Abbey's masterpiece, "Down the River." I was going with 3 of my buddies who were all from Las Cruces, and a bit older. So the spirit of the trip was that of a true coming home to say goodbye one last time. In the news, there was an unfortunate common story of a poor mining town, Silver City, NM in this case, that wanted to sell off a national treasure for the prospect of temporary jobs and a promised allocation of money from an outside source. In this case, it was an increased demand for water coming out of Arizona, because, In the end, the Colorado River was not enough I suppose. The proposition was a dam on the last continuous wild watershed in the continental United States, and in the first designated wilderness in United States History. The water would go to Arizona. The profits to a private company and the biological diversity of a historic monument and wildlife sanctuary would be heavily impacted. The only benefit would be a fund set up for New Mexico to construct the dam, which would be completely used in the construction. So the net "profit" of the construction would be short term employment opportunities for Silver City residents, and some ease of access to water for farmers. For such a small gain, it seems completely ridiculous to even dream up the project. Yet, at the time of this trip, the area was already being surveyed. Fortunately, because of massive public opposition and mobilization, this project has been halted, even under a Republican Governor. The details of the project are thankfully moot for the time being, because of the extremely low likelihood of the project moving forward in legislation, however, it still serves as a reminder of why it is important to protect the remaining wild areas of our world. More info on this project can be found at the Gila Conservation Website. During that 2015 backpacking trip, we spotted a group of Cotamundi at night climbing on the canyon walls. We could see their eyes reflecting the light from our fire on the opposite side of the river. I had never seen that creature before. We couldn't see them very well in the darkness, however, a friend of mine who had been there many times had spotted them before and told us it what the mysterious creature was. During the course of our 50 + mile trek up the middle fork of the Gila River, we were rewarded with hot springs, clear nights filled with stars, lush canyon vegetation, swimming holes, and sculpted cliff walls that would rival any place in the world. Five days in, the trip took an ominous turn following foreboding surreal signs of blairwitch style tarp dwellings that were abandoned and trashed. We climbed up the canyon too soon and ended up chasing an elk trail until it hit a dead end. Tired and impatient we decided to scout the upper canyon edge and became separated from one another!!! All wilderness horror stories flooded my head immediately once I realized what had transpired. What followed resulted in our group of 4, 5 if you count my dog, Dali, getting split into two groups for the rest of our stay. My party took a wrong turn and went up Iron creek until the rocks became so slippery that we were forced to ascend the canyon going straight up, following elk trails again. I should clarify that in a canyon river system it is very easy to lose your sense of direction. Each canyon wall looks the same, and because of the constant river crossings and bends, mixed with the inability to see where the sun is at most points of the day, the natural tools of guidance are limited. Combine that with fatigue and fading light, and you wake up in the morning thinking your heading up the Middle Fork of the Gila when you took a wrong turn up a smaller, and much steeper, tributary creek. After ascending the canyon we followed elk tracks, trying to pinpoint our location and figure out where we were. Guesses lead to more guesses and we found ourselves in the middle of nowhere at a very small spring found out of pure happenstance. Dehydrated and hoping we were close to a trail we decided to scout until we realized it best to fill up our water. An iconic image in most settings in New Mexico, a bull skull, now transformed into the most surreal and ominous signs, sat nailed to a tree next to the very shallow spring. As we continued to ascent we were sure to find the trail we were looking for at the top of the ridge, but when we got there, we only saw another never ending expanse of mountains for miles, with no trail in sight. As an experienced trail man, there have been many moments of where I have experienced Kant's Sublime. The feeling of supreme beauty and terror while looking at the vastness of distance in the western wilderness is a common occurrence. Being a few days walk from your car or any other human being will definitely humble you to the power relationships of the wild. However, at that moment when we were looking at that ever-expanding distance of range upon range, something that would be a great feature on a postcard, I truly knew what it felt to be utterly terrified by it. The logical probability becomes less that one will be discovered, or find their way back, looking over a distance like that with nothing but blue sky and open land. The stillness in the air is palatable, and the only creatures to look to for guidance are the elk up in the distance. The only choice is to go down the other side of the ridge we came up, hoping that we can at least find our way back down to the water. Fortunately, as we get down to the bottom we stumble upon a trail. That trail leads us to a parking area 5 or so miles later that is 15 miles from our intended destination. All we can do is wait and thank the universe we might be able to hustle a ride back to my truck from someone. Still unsure about our two other friends, our plan is to head back down the trails once we establish ourselves back at my truck. About 15 minutes after we had reached the parking area, our two companions who found the right way come driving up in the truck and come to the rescue. Like out of a fairy tale. Surreal. The painting "Our Water" is painted on top of the map I used during this trip. This brings on personal connotations of getting lost, obviously, that relate to the idea of hubris and the mistake of getting lost in looking only at monetary benefits. Additionally, I adorned the coatimundi with a halo incorporating a Mimbres Pottery design to honor the ancient peoples of this land who also had a long and advanced tradition of art making 700 years before the Spanish arrived. Below you will find some of the best photographs I have taken in this sanctuary and national treasure. From the images, I hope you can get a sense of the value this real life garden of Eden in the middle of the desert mountains of southern New Mexico has to the rest of the world. At the moment I am typing this, Donald Trump and an army of oil and gas developers are attempting to shrink Bears Ears National Monument in Utah. It is important for us to stand up and fight every attempt at environmental encroachment, especially at a time of climate catastrophe from decades of environmental misuse. Because otherwise, we may be telling the same story Edward Abbey tells in "Down The River" about how our Garden of Eden was flooded for commercial enterprise.